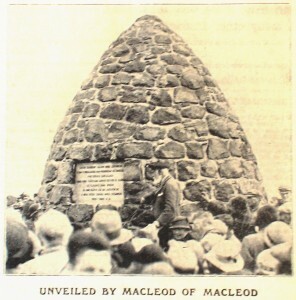 I have just returned from attending the ceremonies in connection with the MacCrimmon Memorials. And glad am I that I should have had the good fortune to be there; it was an event not be forgotten. Moreover, I was most kindly favoured with an invitation to come to the Castle at Dunvegan for the occasion, and that was much to me. I sat at the Chief’s festive board, midst a goodly company, a welcome guest. I saw himself at the one end of the table, and his gracious daughter, Mrs. Walter, at the other, kindly, thoughtful and attentive to all there. But soon it would not be the present Chief I would be seeing, nor the chatter of the company there I would be hearing. It would be Sir Rory Mor I saw at the head of the table, and it would be the words of Clan Ranald’s bard, Niall Mor MacVurrich, that would be in my ears. In the evening we gathered in the great drawing room, where assembled many ladies and gentlemen. As from my seat I cast a glance round the great chamber, my eye rested on the venerable Chief. He stood about the centre of the floor, just opposite the Fairy Flag, his fine head bedded in flowing locks, silver white; his body clothed in the attractive Highland garb–a noble figure. And, attended by other gentlemen similarly clothed, there was presented a scene to be remembered. Suddenly the door was opened, and two pipers, handsomely dressed in full Highland costume, stepped in, playing their instruments. But their music was not the wild, deafening strains we so often hear. There, within the four walls of that room, the music of the pipes fell softly and gratefully on the ear. It was the Ceol Mor (the Great Music) of the MacCrimmons, played by great masters of the art. They had to play again. One felt there could not be too much of it, and was sorry when it ceased. The following morning we went down to the Castle jetty on Loch Dunvegan, whence a boat carried us to a great birlinn lying out in the deep water–a beautiful white thing, spotlessly clean and shining, and trimmed and dressed with all the meticulous care of the perfect sailor. Soon we were speeding across the loch to the further side, where the Memorial cairn was situated. The Chief and his daughter moved among the guests, and the pipers paraded the deck, sending their music across the waves and heralding the approach of the Chief to the waiting crowds. The Chief lands, he joins his people there, and, preceded by the pipers, we mount the hill to the cairn, where the greater number of the people have gathered. The proceedings begin. Rev. Dr. Ross (MacLeod on his mother’s side) addresses the people in their own tongue; and they listen reverently to his words as he reads to them from the Gaelic Bible. The Chief unveils the inscription on the cairn. The pipers play a salute. Then the Chief addresses the great gathering, and at the end calls for MacCrimmons present to come to him. Eagerly many press forward. He has a word for all, and they respond with that combination of freedom and respect which is the manner of the clansman. The Chief is the father of the people, and they act towards him with becoming freedom and respect. Headed by the lads of the Portree Pipe Band, we return to the great white birlinn, which carries us back over our six miles of water to Dunvegan Castle. The swelling notes of the pipes announced to the inmates the return of the Chief. In the afternoon we go to Kilmuir Churchyard, where the people gather in even greater numbers and listen to the words of their own minister, Mr. MacKinnon, and to the very great and impressive address given by Very Rev. Dr. McLean. Then the Chief unveils a plaque let into the wall of the old church in memory of the many MacCrimmons who lie buried there. This is dedicated by a prayer by Dr. MacLean. The piper plays MacCrimmons “Lament for the Children” (seven of his children had died within a year). Dr. MacLean pronounces, in Gaelic, a benediction, and, with the strains of “Cha Till MacCrimmon” (MacCrimmon will never return) ringing in our ears, we depart. That night, and the following night, we attend concerts held in the local hall, which was built by the late MacLeod for the benefit of the people, and which has been improved, by the addition of electric lights, etc., by the present Chief. The succeeding morning, those of us whom mundane affairs call elsewhere say goodbye to Dunvegan Castle and its respective owner, rather sadly. We had tasted lotus and are loath to go.